It has been very frustrating trying to find a natural product to help combat the scar tissue developing on my son’s burn and as it goes worse, I have been feeling desperate. 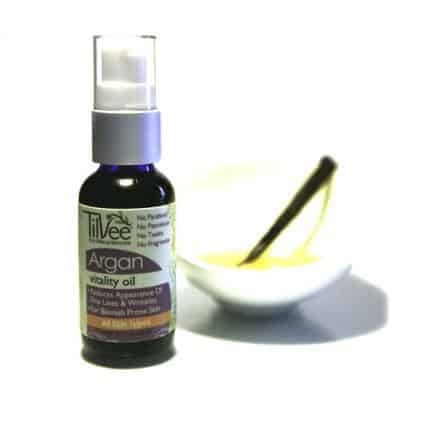 I became hopeful again when I discovered Tilvee Argan Vitality Oil and read that it can be helpful for scars, fine lines, wrinkles and blemish prone skin. Argan Oil has been used for centuries by Moroccan women to revitalize their hair, skin and nails and is known worldwide as “Liquid Gold.” I was impressed with Argan Oil’s ability to “nourish the skin with nutrients that maintain healthy hydration and collagen production, revitalizing and improves skins elasticity.” This sounded like the perfect compliment for Jacob’s dry, thirsty keloid scarring. I applied a small drop to his arm twice a day for one week and noticed that it was softer and felt smoother to the touch. There was no irritation and it absorbed very quickly. Tilvee Argan Vitality Oil is paraben, petroleum and fragrance free which is extremely important to me when using any product on my mine or my children’s skin. Once my son’s scar was taken care of I decided to try Tilvee Argan Vitality Oil on my own facial wrinkles. I have started to notice deep wrinkles on my forehead where I have been squinting all these years in the Florida sun. After applying the Tilvee Argan Vitality Oil I immediately noticed that it was very absorbent and there was no greasy residue. I then decided to use a few drops at the ends of my highlighted hair and loved the results…hair that was so smooth after drying, flat ironing and applying just a tiny touch of Tilvee Argan Vitality Oil. The bottle suggests adding a few drops to your shampoo which is a wonderful idea that I plan to give a try. I don’t like to use a lot of different products on a daily basis so I was really excited with how many uses this oil has for hair, skin and nails (I haven’t tried that yet but plan to during my next manicure). I also had the opportunity to use Tilvee Acai Pomegranate Rejuvenating Masque which is “antioxidant rich, soften and purifies the skin.” This is the first mask that I have used which has a dry formula. It is a really neat concept and tiny amount mixed with water, juice or Argan Vitality Oil covered my entire face and neck. The mask uses Rhassoul to “detoxify, improve tone, texture and elasticity” of the skin. It also uses natural enzymes and bamboo powder to rejuvenate. 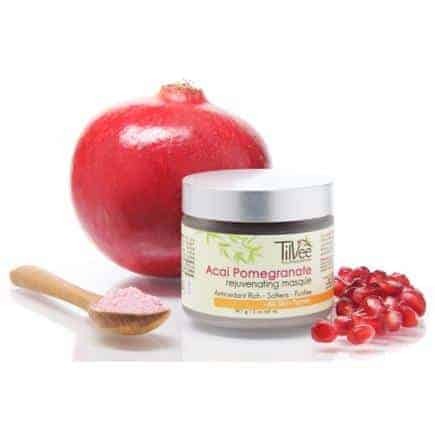 I was a little concerned about using a clay based mask because I have dry skin and I have noticed with other products that it can be too drying but that was far from the results with Tilvee Acai Pomegranate Rejuvenating Masque. My face appeared to glow and felt fresh and clean without that tight dry feeling. It felt like I had been to a spa and had a luxurious treatment. Since having three pregnancies in three years, my skin has felt dry and dull. Now…when I get that feeling, I can use Tilvee Acai Pomegranate Rejuvenating Masque and feel youthful and glowing again.